Just look at that. That’s a work of art, that is. You’ll need a bread maker, but we got ours for $30 — that’s about 18 quid — from Newegg, and it’s been absolutely brilliant so far. The bread maker will mix in the ingredients. The cycle will be done at the end of the second proofing. Just before the cycle is done, preheat the oven to 375 °F or 190 °C. Remove the dough, put it in a bowl, and pound it with a closed fist once or twice until mostly deflated. Put the dough on a lightly floured wooden cutting board or bread stone and shape it in to a rough rectangle, then cut into three strips. Plait the strips together around your fresh stick of rosemary, as in the photograph. Press the ends together and work them with your fingertips to make sure they’re stuck. Cover the tray with a towel and let sit in a warm kitchen for five or ten minutes to rise again. When it’s slightly puffy, put it in the oven and cook until the top is browning. Then reduce the heat of the oven to 330°F or 165°C. Bake until quite brown and until the white bits near the joins make the snapping noise of cooked bread crust when tapped. Let rest for a full 20 minutes on top of the stove before cutting. My one actually looks much browner than it is because of the light quality in our kitchen and LofL’s Nexus camera, which isn’t particularly good even for a phone camera. Trust, it’s a beautiful golden brown. Your loaf will not keep long at all because there are no preservatives or dough conditioners or anything so you must eat it within a day or two. Good for dinner parties and picnics, I think. Excellent with my homemade Vichyssoise. All of my recipes are licensed under CC BY-NC-SA. 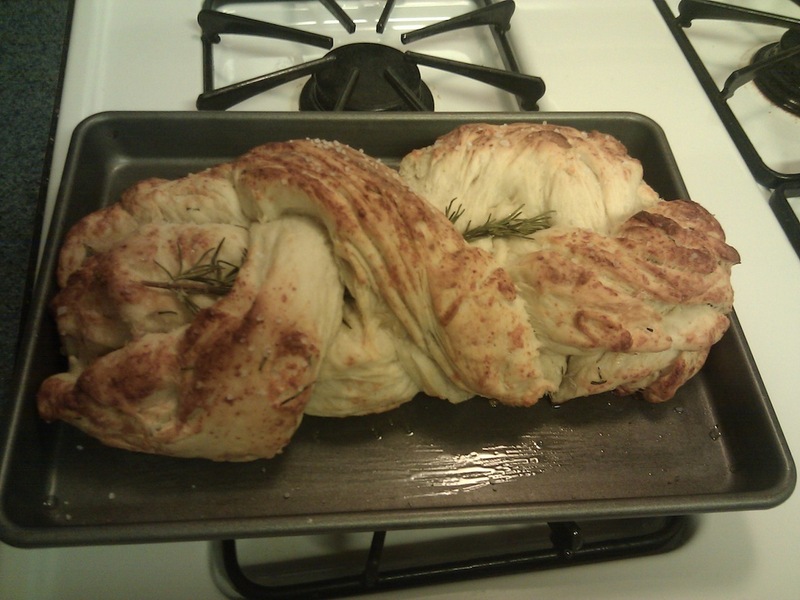 The braided bread loaf looks great!